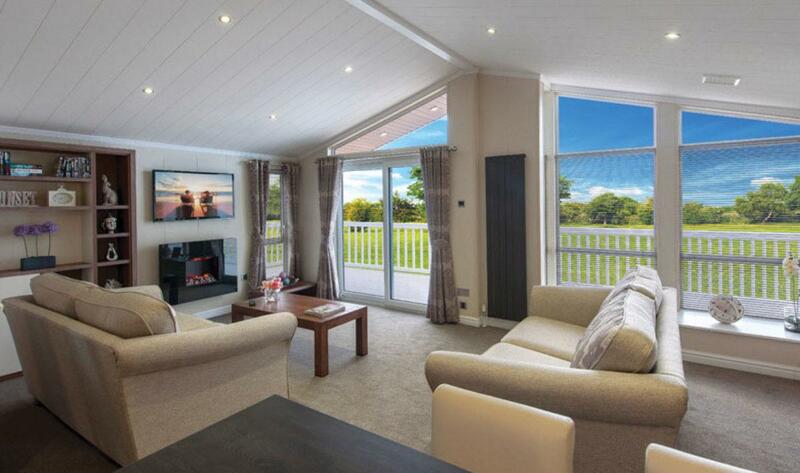 Top of the range Willerby lodge in a stunning sea cliff top position. 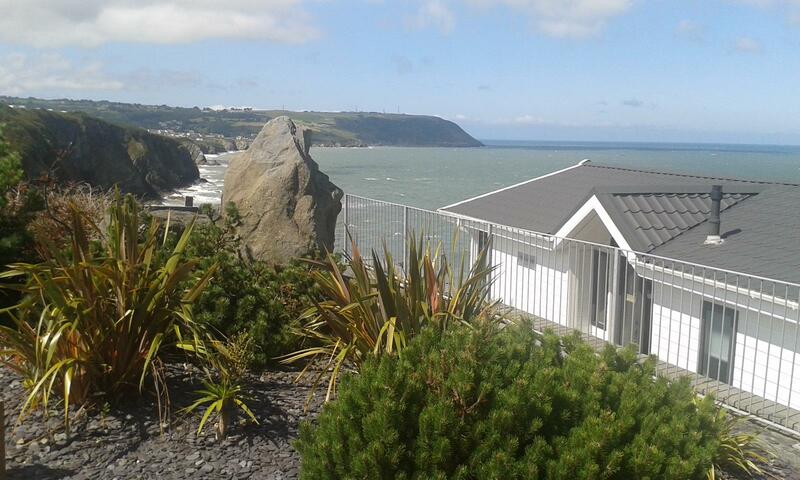 Outstanding sea views from this modern holiday lodge's elevated cliff top position on this prestigious park in Tresaith, close to Cardigan town. 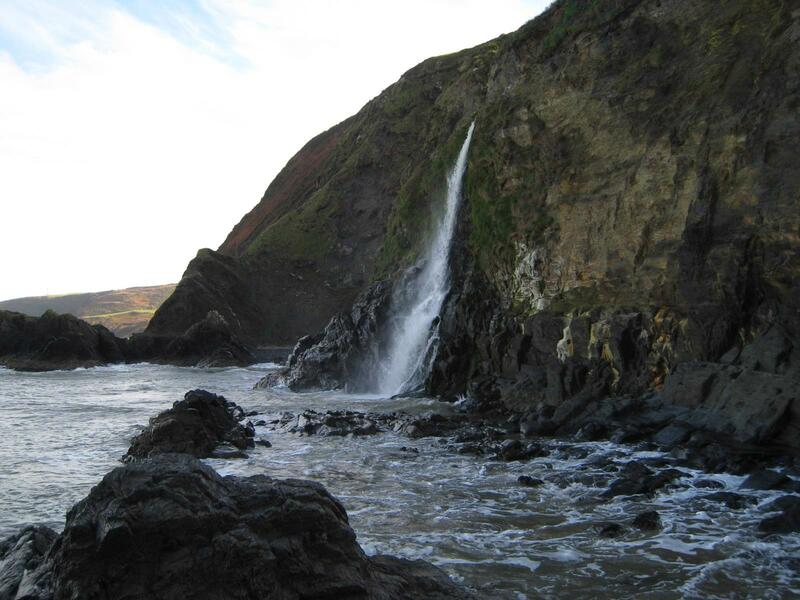 Tresaith has a safe sandy beach with spectacular sunsets and regular dolphin and seal sightings. 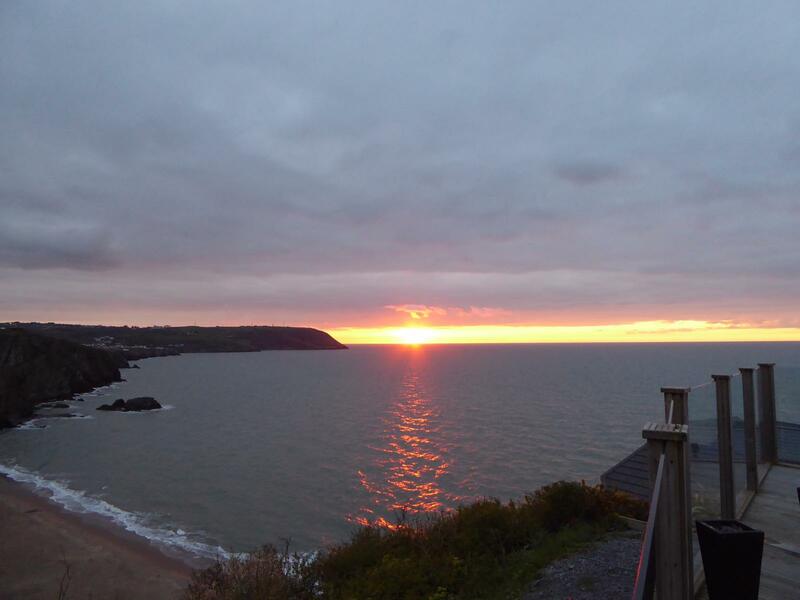 Gwalia Falls Retreat is a small and exclusive lodge/holiday park (non-residential) located on a promontory overlooking the beautiful beach in the idyllic seaside village of Tresaith, just north of Cardigan and near to Aberporth in West Wales. Plot 1 on which the lodge sits, is the premier plot at Gwalia Falls it is in an elevated position with uninterrupted front-line views encompassing the tiny settlement of Tresaith and it's beautiful beach on one side, it also allows sweeping views around across the expanse of Cardigan Bay and up to the Llyn Peninsula and The Snowdon National Park, with the peaks behind Abersoch and others across to Snowdon itself, all of which are visible on a clear day. 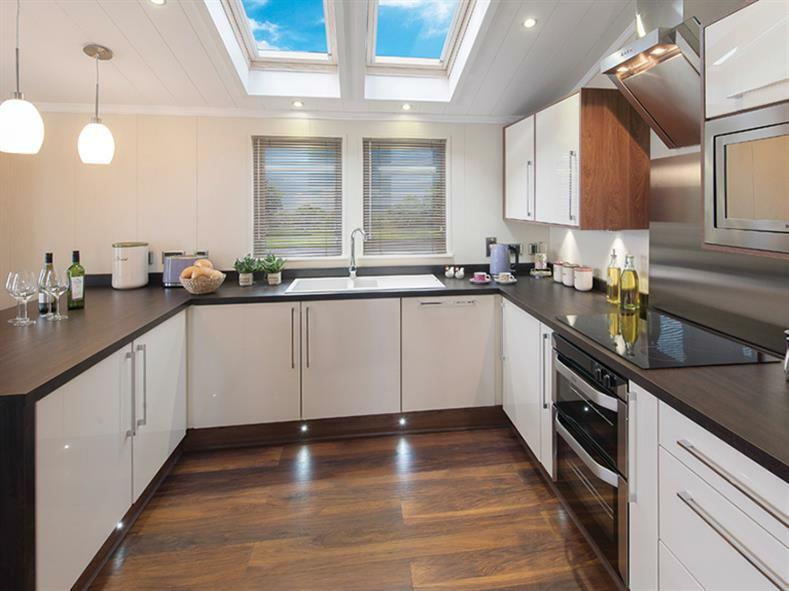 The lodge is a top of the range Willerby New Hampshire S4 lodge with factory undertaken bespoke modifications to extract the best out of its site situation. It was built in late 2014, being sold with most of the current furniture and all of its integrated equipment in place so that the new owners can start using it immediately (other items are available via separate negotiation). 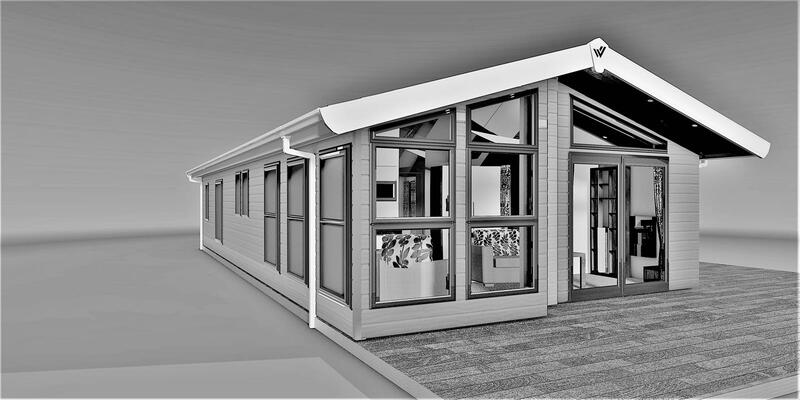 The attached images are a good taster of what is on offer, the sea views and beach photos were taken from the Plot 1 decking, the internal photos are generally Willerby library photos and are very close to what is on offer (some minor differences being inevitable). The river Saith flows through the site and the waterfall cascades to the beach at the cliff edge, it is well worth a visit, being only 200 yards from the Ship Inn and is best viewed from the beach, where that photo was taken. 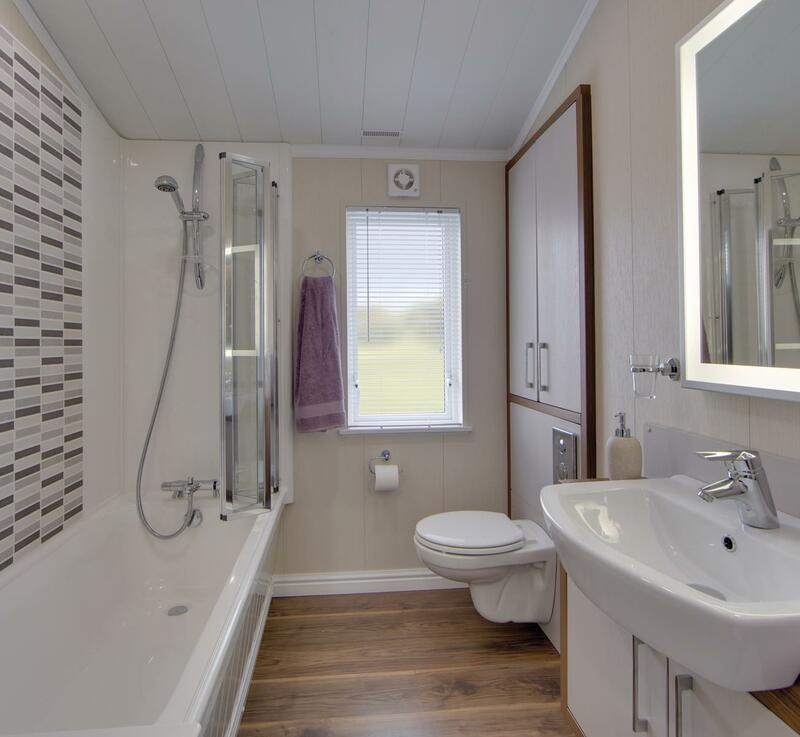 Gwalia Falls Retreat itself is a holiday lodge park, which means that the lodges are for non-residential use (so lodge owners must have another permanent address), the site shuts completely for six weeks every year between mid-January and the start of March. So the owner has over 10 months of potential holiday use! Newly built in late 2014 this luxurious lodge measures 20 x 42 feet. The walls, floors and roof are insulated to residential standards (four seasons BS 3632) and with uPVC double-glazed windows, gas-fired central heating so you'll never be cold, no matter what time of year you visit. The outside is finished in white Canexel external cladding and is tastefully finished off with graphite coloured external window and door frames. All the windows have either blinds or curtains on them and the lounge and bedrooms are carpeted. The kitchen and dining areas have easy to maintain wooden flooring as have the two bathrooms. The internal space has two zones, with the front area (approx. 20 x 20ft) being given over to the open-plan living/dining/kitchen area and the back half being where the three bedrooms and two bathrooms are located and are directly accessible. The front zone is a spacious open-plan living area with multi-aspect views which are enhanced by the addition of extra bespoke side picture windows and the vaulted ceiling which creates an impressive feeling of space. From here a short hallway leads to the rear zone comprising a family bathroom, a guest bedroom, a third bedroom and the master bedroom and leads on into the en-suite shower room. 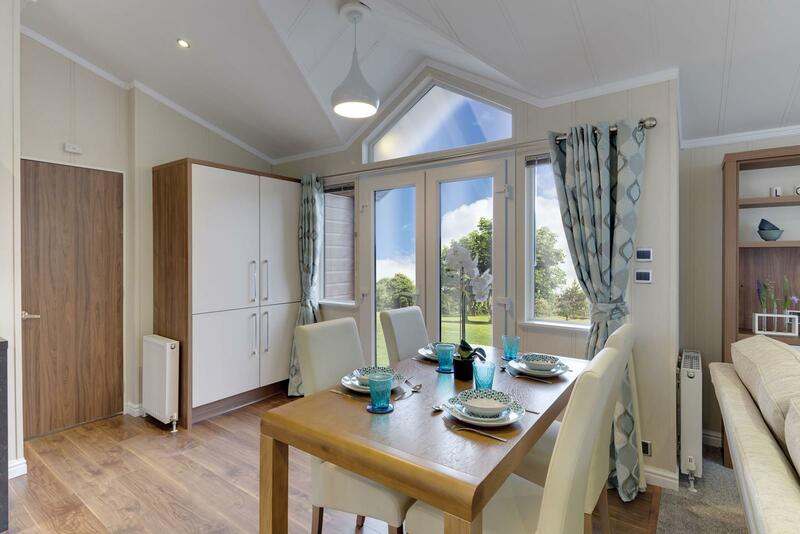 With over 800 square feet of internal space, the lodge is similar in area to the average sized UK bungalow, so you won't be short of space to live and relax in. The glazed main double door located within the attractive porch leads directly into the dining area, on the way and to the right there is a full height store for brooms, coats and shoes. Next to this is the integrated washer/dryer with extra storage above. To the left as you enter the open plan living area, is a large dining table with 6 white leather-effect dining chairs. 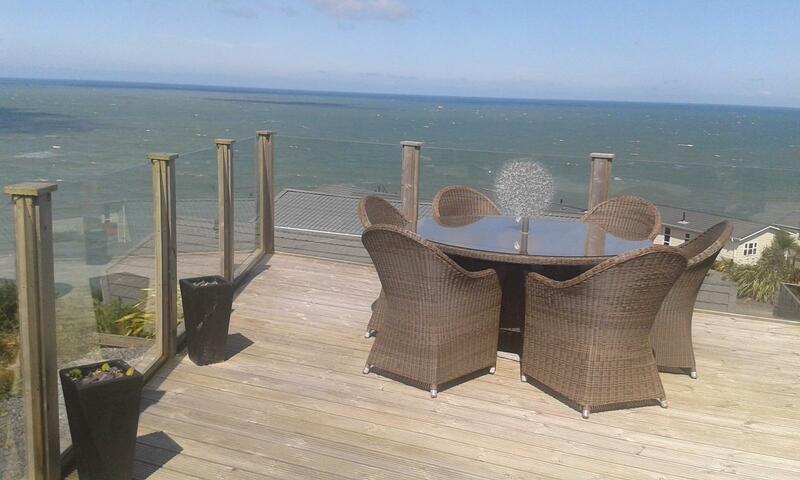 There is a large patio door which gives stunning views across the bay and which allows access onto the decked terrace. The living area contains two white leather sofas. 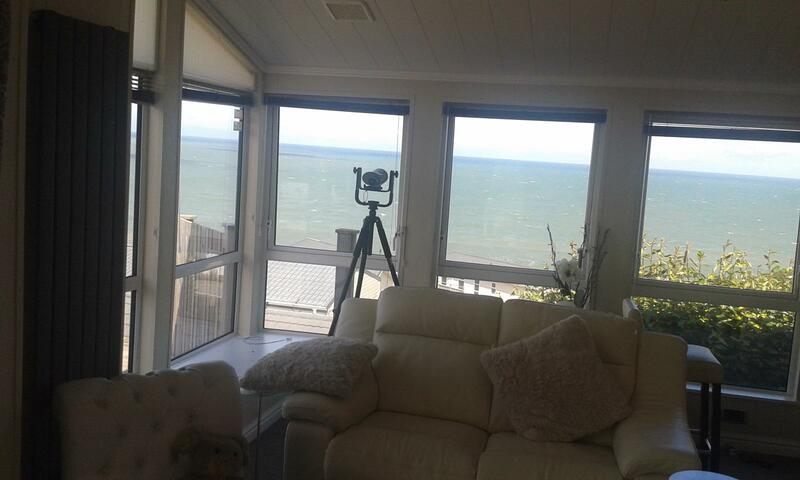 A huge picture window gives stunning views over the sea towards nearby Aberporth, with the two extra bespoke side widows enabling additional amazing views of the ocean and onto the Llyn peninsula. There is TV mount on the wall (current 40” LED TV not included) located above a contemporary stylish Dimplex Opti-myst very realistic flame-effect electric fire which allows warm instant blast of heat when extra cosiness is desired. Between the sofas is a contemporary large wooden coffee table. On the left side of the fire is a large shelf and drawer unit and to the right side is a moveable small table suitable for mounting a DVD player. There is a stylish full height radiator and two other radiators in the lounge area, one of which sits within the breakfast bar; the bar with storage cupboard also has two white leather-effect high chairs and is conveniently located next to the kitchen. The large open-plan kitchen has a modern sink with drainer and mixer tap there is also a 5-ring gas hob with a stainless steel/glass hood and extractor fan above, also a gas oven with separate gas grill is provided, there is an integrated microwave, along with a range of other floor and wall cupboards providing ample storage space. The kitchen side of the breakfast bar contains the integrated fridge/freezer. There are two windows and two Velux windows above that provide a light and airy environment for the cook. A third radiator is located close to the hallway for extra heating to the kitchen/diner. The hallway allows access to the rest of the lodge and has its own radiator within it. 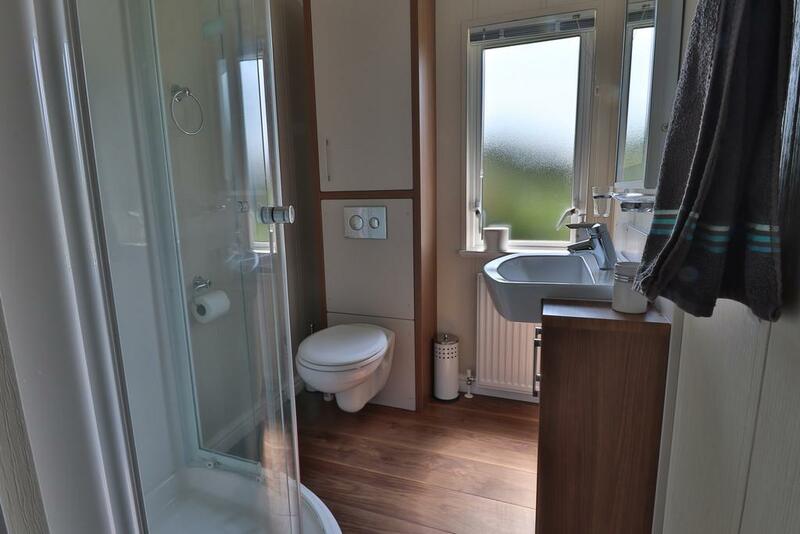 leading into, the en-suite shower room, with WC, basin with mixer tap mounted on vanity unit with storage underneath, LED mirror above basin, good sized corner shower unit, and radiator. Towel rail and obscure window to side. Programable under-floor heating and timer-controlled extractor fan. Spacious room having a double lift up storage bed with mattress. 2 x Bedside units. Dressing table with mirror, large wardrobes with mirrors, shelves, rails, providing plenty of hanging space and drawers. Wall TV mount (TV not included). Radiator. Ceiling and bedside lights. Window to side with more stunning sea views. A useful extra bedroom having a bunk bed with mattresses, demountable to make two singles. between bed, side unit. Wardrobe and drawers. Wall TV mount (TV not included). Radiator Ceiling and bedside lights. Window to side. Contemporary bathroom suite comprising, WC, bath with shower over and glass concertina spray protector, basin with mixer tap mounted on a vanity unit with storage underneath, LED mirror above. Storage cupboard. Towel rail and obscure window to side. Programable under-floor heating and timer-controlled extractor fan. This bathroom contains the gas fired central heating boiler which is situated in a discreate cupboard. This also provides instant hot water for the bathrooms and kitchen. Gwalia Falls Retreat is attractively located and nestled beautifully into the hillside. It is accessed from and is at the same elevation as the main road. Close to the site entrance is a short lane that leads down to the pub (200 yards) and beach (300 yards) ending at the Tresaith sea side. 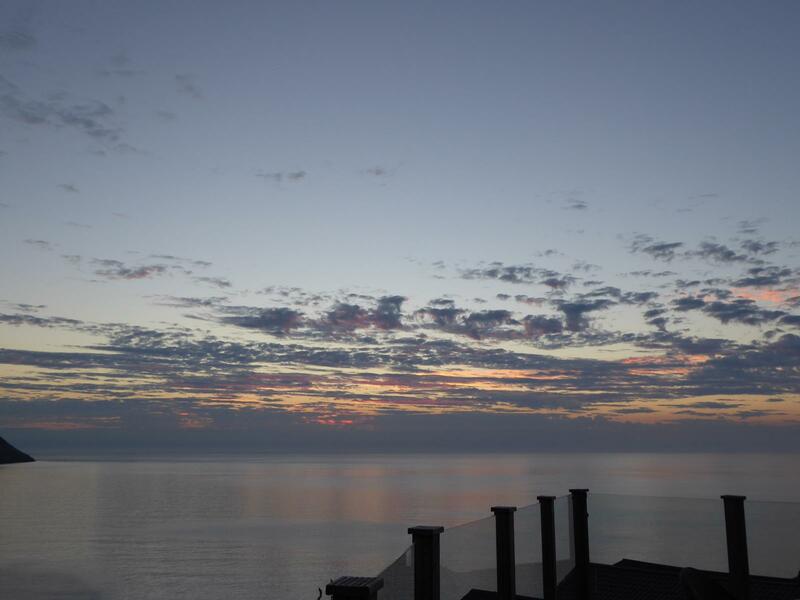 Lodge owners are provided with swipe cards to open the security barrier and allows you to drive via the gently inclined roadway and through the superbly maintained site to the top of the promontory above the beach and sea where the carpark for Plot 1 is also located. The lodge has its parking spaces right next to it and is surrounded by landscaped areas containing lush architectural plantings and impressive large boulder rockeries with night-time courtesy lighting. The site generally has easy walking access to most areas, the approach to Plot 1 is via a few wide and easy steps down from the car parking area, after which all walking within Plot 1 is flat. A timber decked area surrounds the entire lodge on four sides and has no unnecessary steps. The decking has a safety barrier all the way around, the main entrance to the plot has a gate located at the back of the decking plus on the side to secure gate keeps small children and pets contained within a glass-walled balustrade to the front enabling uninterrupted views and also provides some wind protection on breezy days. At the back of the lodge is a large wooden external storage chest for storage of sunbeds, beach gear and brooms etc. 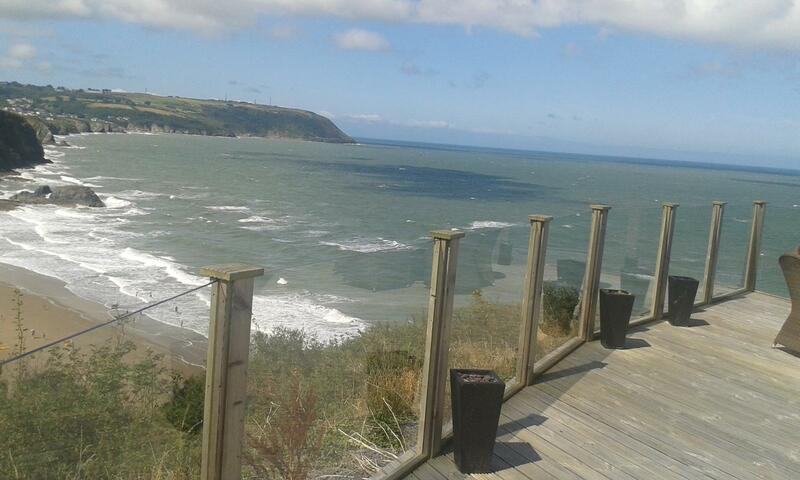 The decking provides a superb vantage point for regular sightings of dolphins, porpoises and seals as well as a multitude of sea and costal birds, even red kites have been seen on the hill close behind the lodge. 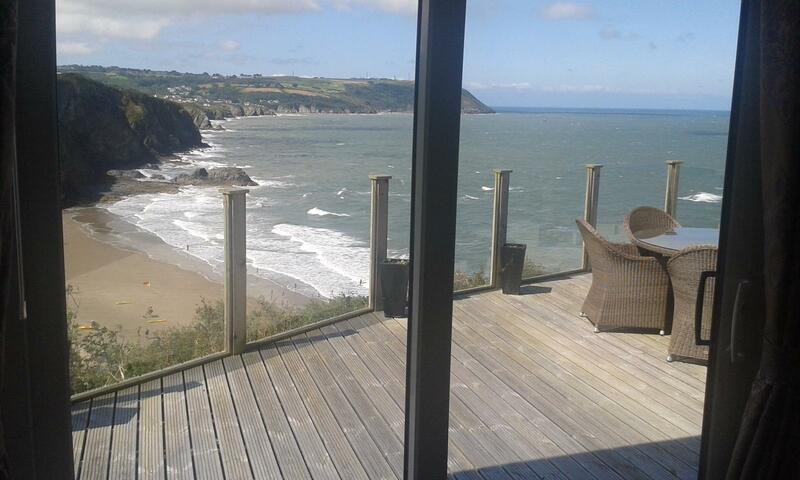 It is also a wonderful large space where you can relax, eat, play, read, sunbathe and take in uninterrupted all-round views of the quaint Tresaith village, the surrounding hills, the beach and beautiful West Wales coast. Tresaith is 7 miles North of Cardigan in the County of Ceredigion in West Wales. It is approximately 100 miles (2 hours drive) from Cardiff, about 250 miles (4 hours drive from London), 150 miles (3 hours drive) from Birmingham and 160 miles (3.5 hours drive) from Manchester. The Wales Coastal Path is visible above the lodge. With its magnificent cliff edge route running right through Tresaith it is a popular spot for walkers (a spectacular extension of the Pembrokeshire coast line). Local coastal walking is suitable for all abilities (flat from Aberporth to near Tresaith and mountainous to the Penrhyn and onto Llangrannog), plus there are also nice country walks close by. 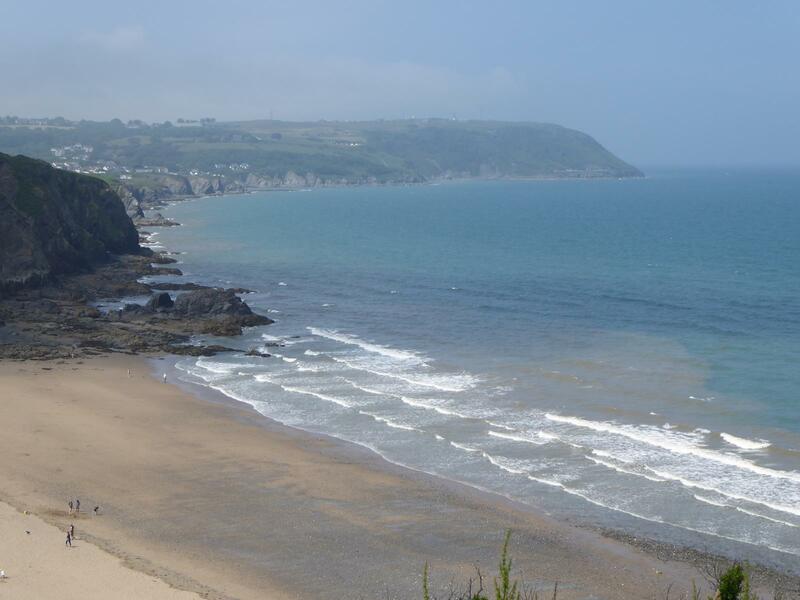 Tresaith itself has a beautiful safe beach (it's usually sandy but occasionally winter storms move the sand around), attended by Life Guards in the Summer, ideal for families and holiday makers. The Ship Inn overlooks the beach and with its large terrace over-looking the beach and excellent range of food and drinks, it's a popular spot with locals and visitors alike. There's also a beach shop selling everything for the beach plus coffee's and ice creams. In the Summer there's also a surf and wet-suit hire shop. The nearest medium size supermarket, fuel station and another pub are 1.5 miles away in Tan-y-groes, with a smaller convenience type supermarket nearer in Aberporth where you'll also find a few more pubs, a range of Takeaways (including a Chinese and a fantastic Fish and Chip shop) plus another wonderful pair of beaches. Cardigan is the nearest large town and has all the amenities you'd expect including Tesco’s, Aldi and B&M, plus a whole range of excellent independent shops and restaurants and the invaluable Mwldan Arts Centre with its two cinema screens for rainy days. There's also an indoor swimming pool with separate toddler's pool in the centre of Cardigan. The Cliff Hotel in Gwbert (just before Cardigan) has a Health Spa and golf course open to non-residents. The impressive castle at Cillgerran, Picturesque St. Dogmaels, Poppit Sands and a great garden centre at Moylgrove are also all within a short drive away. Llangrannog is a very picturesque village located in a Cornwall style cove with two pubs and several restaurants and a shop; it is a nice 2/3 hour walk from Tresaith or 15 minutes by road. In addition, and within a 30-minute drive of Tresaith are the beautiful towns of Narberth, Newport, New Quay and Aberaeron all of which are worth visiting time and again, as well golf courses, fishing lakes, castles, wildlife centres, horse riding facilities, kayaking centres, dolphin spotting trips, sea-fishing trips, music venues, good dining and many more attractions. Although not to date Plot 1 has never been let out and has been retained for the seller’s sole use, letting could be an attractive option. Subject to agreement with the Gwalia site owner, you may be able to let the lodge out to holidaymakers. It means the lodge could pay its way AND deliver a healthy income. This is of course entirely optional and many of the other lodges at Gwalia Falls are not let but used solely by their owners. Some other lodge owners have successfully combined personal use of the lodge with holiday lettings. The lettings are arranged and managed by the owners of Gwalia Falls Retreat (who advertise all of their lodges via Hoseasons). It is understood that a similar lodge had a gross income that regularly and recently exceeded £22,000 per annum delivering a net income of over £14,000. Normally viewing is by appointment only. Please first contact the seller, however generally all of the above-mentioned issues will to be co-ordinated by the Gwalia Falls Retreat site owner.